Everyone likes cookies. Some people even love them 🙂 . But crispy cacao cookies are without any doubt loved by everyone. Make them and come back here and tell me that you love them too. Because you wouldn’t be able to disagree 🙂 . 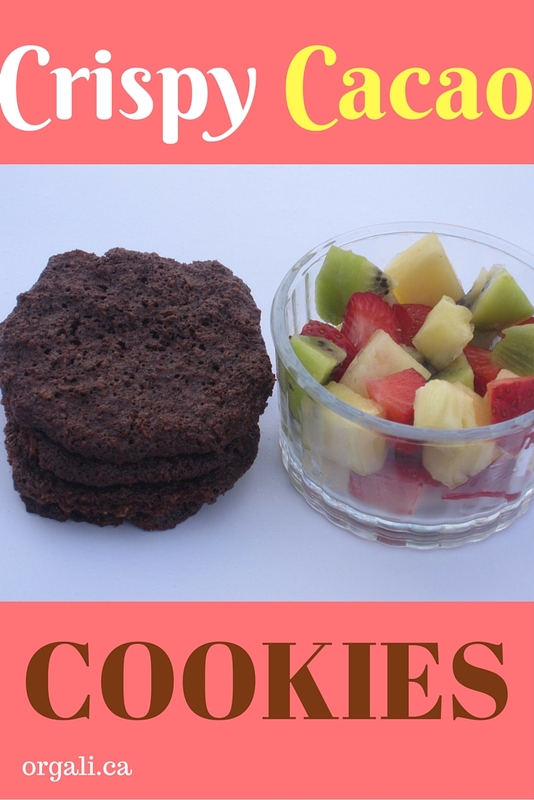 These are some of the best cacao cookies I’ve ever made. I have a friend who can’t get enough of them. Each time we meet she asks me to bring her a batch of the cacao cookies. My kids happily help me make 2 batches because they know one will be for them. I can’t pinpoint exactly why these cacao cookies taste so good. The crispness? The chocolate-y taste? The sweetness? Or maybe a mixture of all three? I hope you’ll give them a chance and make them for your family. You definitely won’t regret! Beat the eggs in a bowl. Add, one by one, almond butter, maple syrup, and vanilla extract. Mix the dry ingredients in another bowl (oats, almond meal, coconut palm sugar, cacao, baking soda, baking powder, and salt). Pour the wet ingredients slowly over the dry ingredients and mix well. Preheat the oven at 350 F and line 3 cookie sheets with parchment paper. Make little balls (approximately the size of two walnuts) with your fingers. They do not have to be perfect as the dough is sticky. Put 3 balls in each row on a parchment-lined cookie sheet. The cookies will spread when they bake. If you put more than 3 balls per row, they cookies will stick together when they bake. Make 5 rows (with 3 balls per raw) per cookie sheet. Bake at 350F for 15 minutes. Remove the cookie sheets from the oven. The cookies should not be crispy yet. They should be soft to the touch. Leave the cookies on the sheet for 5 minutes, then use a spatula to lift them from the parchment paper, but do not take them off the cookie sheet yet. Transfer them to a plate when they are cold and crispy. Store the cookies in an air-tight tight container in the fridge for up to one week (if they can last that long 🙂 ). Do you know anyone who does not like cookies? Hi Alina, My Kids love cookies..I love baking for them but I occasionally give in to chips a hoy. I will be trying this and anything healthy for my family , count me in 🙂 Stopping by from A Bountiful Love. God bless..
Hi Khit, I hope you will have a chance to try these cookies as they are delicious :). Thank you for stopping by! They are one of my go-to cookies when I need to make a delicious dessert. I am so glad they turned out well for you!